Take a comprehensive look at what the LIFEPAC curriculum covers with the LIFEPAC Scope & Sequence from Alpha Omega Publications! This booklet is divided into separate sections for each LIFEPAC subject: Bible, History & Geography, Language Arts, Math, and Science. Within each subject section are listed individual grades K-12 and the units with corresponding topics outlined in a clear, easy-to-follow column format. Using this at-a-glance resource, you'll be able to easily locate what topics are studied in each LIFEPAC subject, grade, and unit. 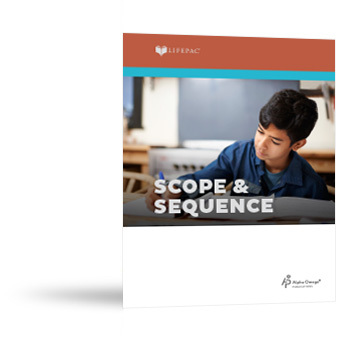 The LIFEPAC Scope & Sequence also offers a complete look at topics studied in each of the LIFEPAC elective courses, making this resource perfect for parents considering switching to the LIFEPAC curriculum and for helping identify possible learning gap areas. Also included is a quick overview of the Philosophy of Education for the Bible-based LIFEPAC curriculum.